Appearance: The ankh is one of the most familiar of Egyptian hieroglyphs. It resembles the Christian cross, with a loop above the transverse bar. Theories on its origins are numerous and varied; ranging from sexual symbolism to the common sandal strap. Like the Knot of Isis, which it resembles, it is most likely depicts some kind of elaborate bow. Detailed representations of the ankh show that the lower section is actually comprised of two parts - the ends of the bow. Early examples of the ankh actually show the ends separated. Originally, the ankh may have been a knot with some specific religious or mythical significance. Meaning: While the origins of the ankh may be obscure, the meaning is certainly clear - "life". It is with this basic connotation that the sign is carried in the hands of many Egyptian deities. 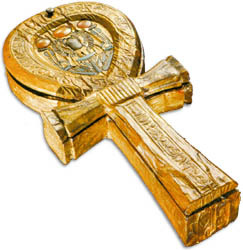 The ankh may represent the life-giving elements of air and water. It was often shown being offered to the king's lips as a symbol of the "breath of life." Anthropomorphic pictures of the ankh sometimes show it holding an ostrich-feather fan behind the pharaoh in a variant form of this idea. Similarly, chains of ankhs were shown poured out of water vessels over the king as a symbol of the regenerating power of water. Libation vessels which held the water used in religious ceremonies were themselves sometimes produced in the shape of the ankh hieroglyph. The popularity of the ankh is evident in the numerous and varied types of everyday objects which were shaped in the form of the ankh. In Tutankhamun's tomb, a gilded mirror case was found in the shape of the ankh (see above left). The artist clearly was enjoying a play on words, as the Egyptian word for "mirror" was also, "ankh." Other objects such as spoons and sistrums were constructed in this familiar shape. The ankh was popular throughout Egyptian history and due to its cruciform shape remained so into the Coptic period. It entered Christian iconography as the crux ansata, the handled or "eyed" cross.